The United States Congress designated the El Paso Mountains Wilderness (map) in 1994 and it now has a total of 23,679 acres. 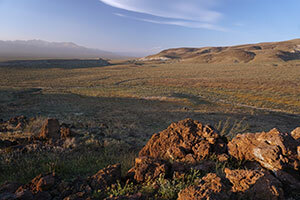 All of this wilderness is located in California and is managed by the Bureau of Land Management. The El Paso Mountains drop into this Wilderness from the southeast, with Black Mountain, at 5,244 feet, serving as the highest point. From the foot of Black Mountain, the terrain sinks into the Black Hills and gives rise to numerous dark volcanic mesas and reddish buttes dissected by narrow canyons--in short, badlands topography. Most human visitors are attracted to an abundance of cultural sites, and the southern portion of the area is included in the Last Chance Archaeological District. Some of the oldest nonmarine fossils ever found in the West were discovered here: ancient camel-like and horse-like animals. Rock hounds also find much to their interest, interrupting their hunt to peer at the occasional desert tortoise, Mojave ground squirrel, or raptor wandering by. Creosote bushes, the most ubiquitous desert plant in the United States, reign supreme over much of the region, while Joshua trees cling to the western side of Black Mountain. Planning to Visit the El Paso Mountains Wilderness? How to follow the seven standard Leave No Trace principles differs in different parts of the country (desert vs. Rocky Mountains). Click on any of the principles listed below to learn more about how they apply in the El Paso Mountains Wilderness.